Sedentary jobs may appear relaxing at a first glance, but sitting for 8 to 9 hours a day does take its toll on the body, so workers need to take breaks to stretch their legs and walk around, or just do some kind of quick exercise. While these methods might alleviate some of the issues that come with sitting all day, they certainly aren’t the long term solution for keeping one’s spine straight and heart healthy. Many medical studies have proven that sitting for extended period of time can contribute to the following diseases: scoliosis, increased blood pressure and cardiovascular disease. 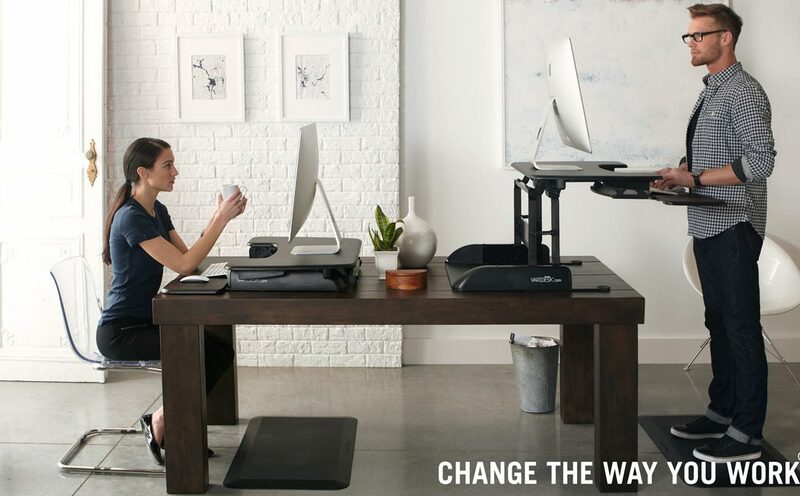 To combat this, a great number of business owners have decided to equip their offices with standing desks, however, it is very questionable whether this is the best way to go about tackling the problem, since it seems like all this is doing is exchanging sitting all day with standing all day. Being sedentary all day is bad for one’s health but so is standing and instead of going from one extreme or the other, as in most things in life, the best options seems to be a middle ground. By middle ground I mean doing both sitting and standing periodically during those eight hours of work. This can be achieved with an adjustable sit to stand desk. By using this type of desk you could sit or stand depending on what your body needs at a particular moment. All you’ll need to do is adjust the desk to fit your desired posture. Since not all sit to stand desks are the same, you need to know a few things before choosing the right one. Adjustment wise, you could use an electric one which is the most reliable method, but also a bit more costly. The other option is the pneumatic one which uses liquid or air to adjust the height. This variant is less reliable but also less expensive. When it comes to design, sit to stand desk models differ according to the material the top of the desk is made of. It could be made of wood, metal, plastic or glass, all of which can have different layouts. A sit to stand desk can also help with one’s concentration since it provides the option of not being stuck in the same position for hours. Business owners could also benefit from this when it comes to the potential increase in the workplace efficiency. Ensuring that the employees are comfortable during work-hours is a priority, especially in an office environment where they are required to stay in one place for a long time. Reducing sedentary time can improve physical, metabolic and even mental health. This is why alternating between standing and sitting could be very beneficial for both employers and employees.